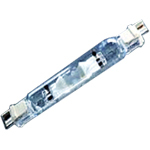 Your saltwater corals will love the 150 Watt 10000 kelvin REPLACEMENT HQI Light bulb. 14000 kelvin on this bulb which is a just right for getting those corals nice and perky in your saltwater tank. Change your aquarium bulbs every 6 months like all HQI bulbs should be. If you have any question on aquarium lamps bulbs or other items feel free to email us. 70 Watt HQI lamp. This bulb is a sweet color @ 14000k. Perfect for your aquarium.